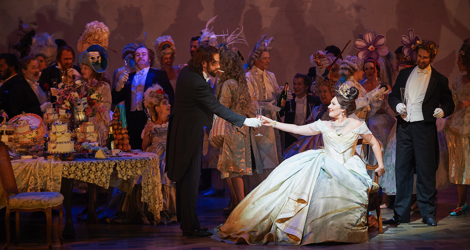 The Canadian Opera Company’s new production of Verdi’s La Traviata is one that audiences will want to see again and again. Director Arin Arbus does not force a modern concept onto this pillar of the standard repertory as did the COC’s previous production by Dmitri Bertman, but rather seeks to illuminate the characters and themes as they exist in the original opera. The result is a period production that also feels completely fresh and is beautifully sung by a well-chosen cast. For one sign of Arbus’s attention to detail one need only compare the beginnings of Acts 1 and 3. Both the overture and the prelude to Act 3 begin with a high, straining melody in the strings associated with Violetta’s illness – consumption as it was known then, tuberculosis as it is known today. During the overture Arbus has lighting designer Marcus Doshi shine a spotlight through the translucent silk brocade curtain covering the stage opening on Violetta (Ekaterina Siurina*) as she is being helped into an enormous bustled and petticoated ballgown by her maid Annina (Aviva Fortunata). When the overture ends, the curtain and the lights go up on a party at full swing that Violetta is hosting. 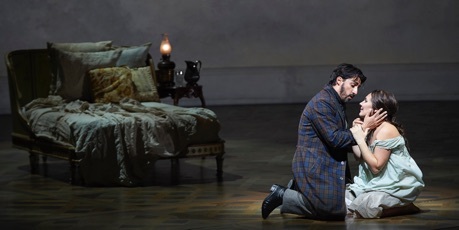 During the prelude to Act 3 Doshi again shines a spotlight through the brocade curtain on Violetta, now on her deathbed where Annina is in the process of changing the sweat-soaked bedlinen by halves while the weakened Violetta remains in bed. When the prelude ends the lights and curtain go up on the same room as in Act 1, but half-lit and devoid of all other furniture. In this simple but powerful way – associating mistress and servant with masses of fabric – Arbus contrasts Violetta at the height of her powers with the same woman at their ebb. Set designer Riccardo Hernandez contrasts the tasteful, gently curving wall of Violetta’s Paris apartment where she feels comfortable with the angular room in the country house where she lives with her lover Alfredo (Charles Castronovo*) and receives one piece of bad news after another, not least from Alfredo’s father Germont (Quinn Kelsey*), who wants her to give up Alfredo for the good of his family. Hernandez also contrasts plain stateliness of Violetta’s Paris apartment with the black-and-red garishness of the similarly shaped apartment of her friend Flora (Lauren Segal). In her Director’s Notes, Arbus says she is struck by Violetta’s description of herself in Act 1: “Povera donna, sola / Abbandonata in questo / Popoloso deserto / Che appellano Parigi” (“A poor woman, alone and abandoned in this populous desert they call Paris”). Thus, the luxury and the company of other people surrounding her give her no comfort. To this end the costume design both at Violetta’s party in Act 1 and Flora’s in Act 2, though based in the 19th century is pushed toward the grotesque. At Violetta’s party the buffet set in the centre on sickly yellow tablecloths looks quite unappetizing and half the party guests are in bizarre forms of masquerade. At Flora’s party the theme is more lugubrious. The “gypsies” there to entertain are made up as death’s heads and to illustrate their song about a bullfighter and his lady, a bull’s skull and a bull’s skeleton manipulated like a puppet decorate the scene. The use of two masquerade scenes is unnecessary since only the second is said to be a masked ball, and costume designer Cait O’Connor does underline rather too heavily with all her skeletons that Flora’s party is for Violetta a halfway house on the way to death. Yet, through all this Arbus does highlight the point that gives the story of Verdi’s opera such universal appeal – its depiction of a woman who tries to seize what remnants of truth and happiness she can find in an otherwise corrupt world. The COC has assembled an extraordinarily fine cast. Real-life husband and wife, American tenor Charles Castronovo and Russian soprano Ekaterina Siurina, play Alfredo and Violetta. Siurina has a beautiful voice that retains its warmth even in its coloratura passages. She does not give the impression of unlimited lung-power, a point not helped during Act 1 when conductor Marco Guidarini had not yet established a good balance between the pit and the stage. Unlike the other principals, Siurina gave the impression during the first two acts that she was more concerned with beauty of tone and line that with drama since she seldom coloured her voice to reflect the various agonies Violetta undergoes. Yet, in Act 3, she proved that she could indeed colour her voice and to great effect. Castronovo has exactly the easy, full Italianate sound that is perfect for the role of Alfredo. His high notes come easily and naturally and his voice always reflects the drama of his character’s situation. He and Siurina both employ a rather more generic acting style than we have become used to lately, but, as in olden days, the audience will readily forgive them that given the beauty of their singing. The one of the three principals who embodied both subtlety of acting with refinement of singing was Quinn Kelsey as Germont. His is completely unlike the harsh or manipulative Germonts one frequently encounters. Rather, the warmth of Kelsey’s gorgeous baritone and the delicacy of his phrasing convey sympathy for Violetta from the very beginning. He knows he is asking her to make a terrible sacrifice but implores rather than demands that she make it. His remark that men are fickle, Arbus has already shown by opening Act 2 with Alfredo already turning his attentions to the housemaid. 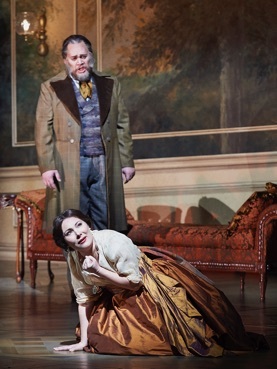 Because of Kelsey’s ability to communicate such complexity of thought, Germont’s interview with Violetta was the highpoint of the opera and received the loudest and most sustained applause. Other roles are all well taken. Aviva Fortunata is an empathetic and pure-voiced Annina, Robert Gleadow* an authoritative Dr. Grenvil and Lauren Segal a seductive Flora. Once conductor Marco Guidarini was able to suit the volume of the orchestra to that of the singers, the music-making went from strength to strength. Guidarini is especially adept at finding a plaintive tone to even the most joyous music in the opera, even in the drinking song “Libiamo” or in Violetta’s song of freedom “Sempre libera”. This creates an atmosphere of disillusionment that seems to run through the entire opera that Arbus has made the basis of her production. Together they provide an admirable unity of interpretation in music and staging not often found in other productions. *On October 16, 30 and November 6, Joyce El-Khoury will sing Violetta, Andrew Haji will sing Alfredo, James Westman will sing Germont, Neil Craighead will sing Dr. Grenvil and Thomas Goerz Baron Douphol. Photos: (from top) Robert Gleadow as Dr. Grenvil and Ekaterina Siurina as Violetta; Charles Castelnuovo as Alfredo and Ekaterina Siurina; Quinn Kelsey as Germont and Ekaterina Siurina. ©2015 Michael Cooper.